When you're redecorating a bathroom, you're probably focused more on your fixtures, paint color, vanity and wall art than how you're going to display your towels. Sure, you might spend a considerable amount of time deciding on what color towels you want or which patterns should be featured on them, but you probably weren't thinking of displaying them in a way that doesn't involve a towel bar. However, you might want to reconsider your plan - a nice towel display can make all the difference in a fashionable washroom. Here are some ideas to spark your creativity. 1. A shelf made out of something vintage. Whether it's a decorative carved chair, a bench or a table, vintage furniture items can make lovely towel shelves, according to Better Homes and Gardens Magazine. 2. A decal with added hooks. Wall decals are big these days, as they can add fun and flair to any space. You shouldn't have a problem finding one that will fit your bathroom's motif. Once you've chosen a good one, Houzz.com suggests attaching hooks to the wall where it makes sense on the decal. For example, you could add hooks on the branches of a tree decal for a cool, functional towel display. 3. A color-coordinated stack. 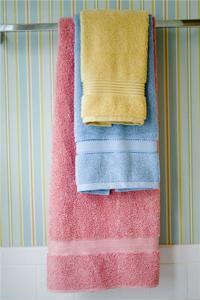 If you have space, you might just want to stack an arrangement of color-coded towels. For example, stack the darkest on the bottom and the lightest on top. Then arrange the matching hand towels or washcloths decoratively on top of that. Simple! 4. Rolls. Rolled-up towels look decorative in pretty much any setting, whether they're placed in a pyramid on open shelving or arranged neatly in baskets. As a bonus, it's easier to roll a towel than to neatly fold it. 5. Ribbons. If you'd like to take a stack of towels and turn it into something a bit more decorative, you could always get a coordinating ribbon and tie it like a package over the stack. It's like a chic little present! 6. A vintage ladder. If your home is decorated with a country theme, you could get away with putting a vintage-looking ladder in your bathroom and using the rungs as towel racks. One with wider steps could also hold accents like candles or plants. 7. On a clothes hanger. Especially if you have frequent guests, a clothes hanger makes an attractive and useful display. Just fold the towels on it, then hang them from a hook. Your guests will be able to take them to and from the bathroom easily, reports Better Homes and Gardens.